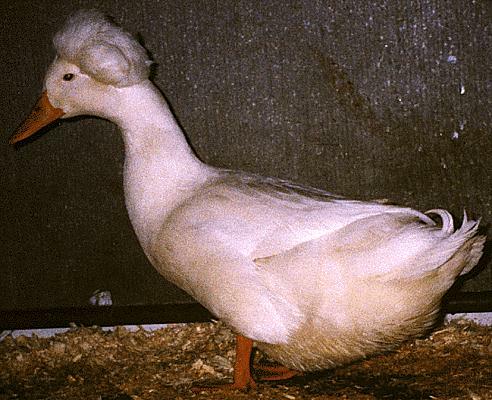 We have a fair assortment of ducks to offer, both in the CRESTED and Non-Crested varieties. Crested is a recessive gene, but we have selected our breeding stock from very heavy crested specimens. We hope you are as pleased with yours as we are with our flock. Ducks are very hardy birds once they are feathered. 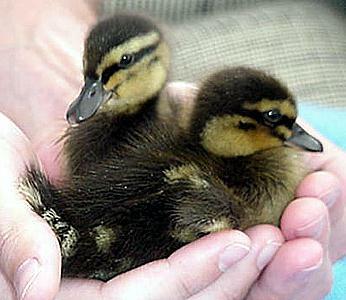 You need to place a minimum order of 15 ducklings for them to arrive safe and warm. While they are young, great care should be taken so they do not drown in their drinking water. 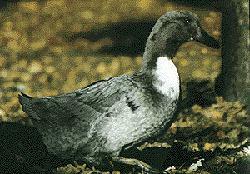 Ducks require a NON-MEDICATED starter ration, also known as game bird starter. We offer Blue Swedish, Pekin, and Fawn and White Indian Runners in the Crested varieties. 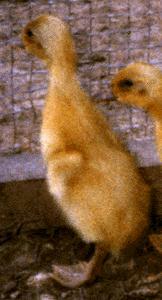 So very funny to see a Runner duck "running", they do walk upright and not waddle like other breeds of ducks. They look a wee bit like a bowling pin with legs. 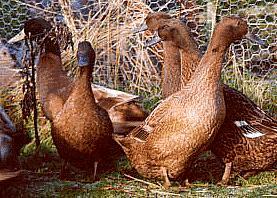 Khaki Campbell, Rouen and Pekins in the non-crested varieties. The Blue color is a somewhat unique genetic feature. There is some recurrence in the offspring being not only blue, but there also will be some black, white, and Black and white combinations (splash) with an occasional grey or silver. ALL will carry the Blue gene. In our breeding flock we only use males with the finest Blue color.